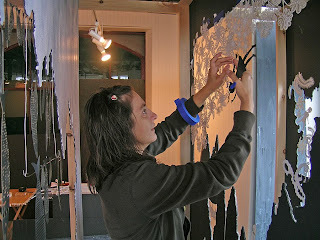 Andrea Dezso has probably one of the hottest art careers in the Pioneer Valley. She has designed two NYC subway stations as well as creating a mosaic for the Bucharest American Embassy in Romania. She will be having her first Chelsea area NYC exhibit this year. Stay tuned. Biennial Artist Covers Boston with Wool!